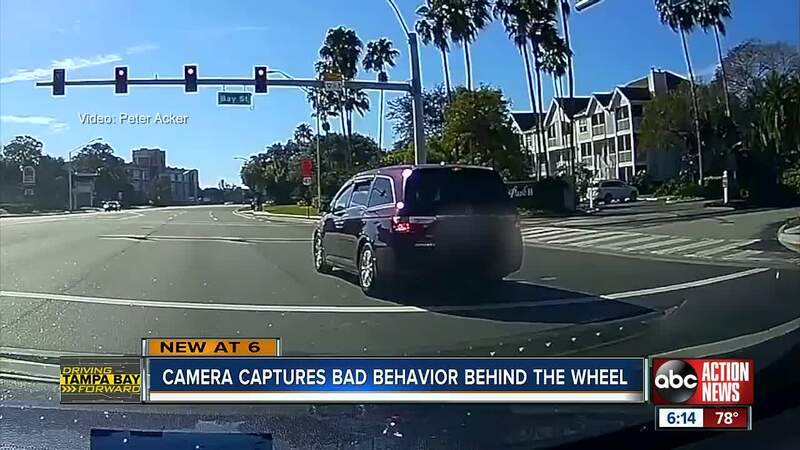 Dash cam video in Sarasota captured the driver of a minivan creeping through an intersection at a red light before driving right through it. SARASOTA, Fla. — We've all seen a driver like this at a red light, creeping through the crosswalk, hoping for the light to turn green. Well, dash cam video in Sarasota captured a driver of a minivan creeping through an intersection at a red light before driving right through it. ABC Action News spoke with the man who recorded the video off US 41 and Bay Street earlier this week. ABC Action News reached out to FHP about the video and Lieutenant Greg Bueno said most importantly not abiding the traffic laws in place puts the safety of pedestrians and other vehicles in the area at risk. Bueno said disregarding a traffic signal like this this is a moving violation that puts three points on a license. In Southwest counties, it would cost $163 for a citation. NOTE: FHP says they cannot try and find the driver because they did not witness the moving violation.